Hampton Roads is the name of a large metro area in southeastern Virginia. This is where the James River pours into the Chesapeake Bay and the Atlantic Ocean. With the world's largest natural harbor, Hampton Roads ports have played an important role in our nation's history. Hampton Roads is the birthplace of America. It is home to Jamestown, the first permanent English settlement, and to Colonial Williamsburg. Rich history and beautiful waterfront to create a fun and welcoming place for visitors of all ages. 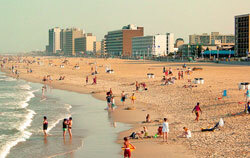 Virginia Beach is more than a boardwalk and a long, wide beach. It's a vacation resort with a rocking amphitheater, good restaurants, night clubs, fun amusement parks, an aquarium, quality golf courses and truly special events. Plan your fun in the sun. Hit the beach. And don't miss our guide to Virginia Beach oceanfront hotels. Williamsburg Virginia is the other big vacation destination in Hampton Roads. It offers the historic areas in Colonial Williamsburg, Jamestown and Yorktown. There's also great fun at Busch Gardens and Water Country USA. There are enough excellent golf courses in the immediate area to play a different one every day. Top your visit off with shopping at the factory outlets and the famous Williamsburg Pottery. Norfolk Virginia has the good things you expect from an urban city, wrapped up in a beautiful setting on the Elizabeth River. Norfolk attractions include first class museums, live music and theater, shopping, fine dining, professional sports, cruises, a zoo and botanical gardens ... and more. There's a lot to see and do in Norfolk and it's a short trip from both Virginia Beach and Williamsburg. 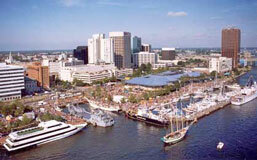 Portsmouth is sometimes overshadowed by Norfolk, which is located right across the Elizabeth River. The downtowns of these two cities are so close that you can hop on a ferry and go back and forth. Olde Towne Portsmouth is located within easy walking distance of the river and it's where you'll find the Children's Museum of Virginia, the Virginia Sports Hall of Fame, the Courthouse Galleries, and The Lightship Portsmouth. The nTelos Pavillion is a 6,500 seat amphitheater located on the waterfront - you can see national acts there during the warm months. Great weather and beautiful scenery makes Hampton Roads a fun place for outdoor festivals. Discover the huge variety of live music that can be found in Hampton Roads. Cruise to the Bahamas from Norfolk or take a fun and informative cruise of local waters. Enjoy a vacation in a beachfront home-away-from-home. Hampton Roads is a great place to during the Christmas holiday season.